The deep blue Mediterranean Sea looked beautiful that July 31, 1944, day, but the lone French pilot of the small reconnaissance plane did not notice the beauty. He did notice that his fuel gauge was registering very low. He knew he had taken some hits from the Nazi-Vichy anti-aircraft batteries. Apparently, at least one had pierced his fuel tank or lines. He would never be able to reach his base in North Africa. Figure 1. 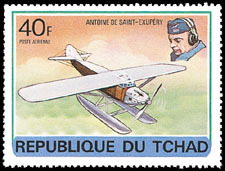 Chad honored Antoine Saint-Exupery on this airmail stamp issued in 1978. The pilot had published a book only the year before. He had called it Le Petit Prince. The English translation, The Little Prince, was published in 1944. In that book, engine trouble had forced a pilot to make an emergency landing in the Sahara Desert. The fictional pilot was trying to repair the engine when the Little Prince from Asteroid B-612 visited him to discuss what it meant to be alive and "other matters of consequence." But that was fiction. Here he faced the reality of a forced landing in the Mediterranean and almost certain death. Yet he remembered that he had faced death earlier, at the beginning of World War II. His plane had been shot down over southern France, but he had managed to escape through Portugal to the United States. There, in 1942, he published Pilote de Guerre, a nonfiction account of his wartime experience. Figure 2. Senegal issued the first stamps to commemorate Antoine Saint-Exupery as a writer, rather than as a pilot, Aug. 30, 1989. Each of the stamps features an open-book design with a portrait of Saint-Exupery and the title of one his works. Click here for image of all three stamps. That pilot was Frenchman Antoine Saint-Exupery, and that July 31, 1944, flight was to be his last. He and his plane were never found. 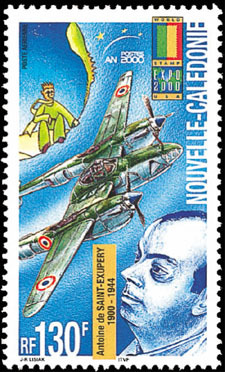 Saint-Exupery was first honored on stamps for his exploits as an aviation and airmail pioneer. Just three years after he and his plane disappeared, French West Africa featured his portrait on an 8-franc airmail stamp (Scott C11) issued March 24, 1947. Other airmail stamp issues honoring his pioneer airmail exploits followed. France featured Saint-Exupery on one of its airmail semipostal stamps issued in 1948. The stamp is denominated 50 francs+30fr (CB1). He also is pictured along with Jean Mermoz and a Concorde jet on a 20fr French airmail stamp released Sept. 19, 1970 (C43). Cameroon shows Saint-Exupery on a 60fr airmail stamp (C246) issued May 20, 1977, in a set featuring aviation pioneers and events. A little more than a year later, on Oct. 25, 1978, Chad included him on the 40fr low value (C232) of a set saluting aviation history and the 75th anniversary of the first powered flight. Figure 1 shows this airmail stamp from Chad. Figure 3. Israel marked the 50th anniversary of Antoine Saint-Exupery's presumed death on this 1994 stamp. I must confess that none of the aforementioned stamps appears in my collection of journalists, authors and poets on stamps. Until 1994, the only Saint-Exupery stamps in this collection were a set of three Senegalese stamps issued Aug. 30, 1989 (821-23). Figure 2 shows the trio. Notice that for the first time these Saint-Exupery stamps are not airmail issues. Although the usual aircraft appear, they are dwarfed by an open book design. The left page of each book features a Saint-Exupery profile portrait. The right page contains the title of one of his books. These stamps from Senegal are the first stamps to honor Saint-Exupery the writer. Figure 4. A 1995 Argentine semipostal souvenir sheet honoring pilot-author Antoine Saint-Exupery was issued to raise money for the Latin American Air Post Philatelic Exhibition. Click here for larger image. The title of Saint-Exupery's first novel, Courrier Sud (Southern Mail) appears on the 180-franc stamp. As a commercial pilot, Saint-Exupery had flown mail routes to West Africa and South America. The novel is based on these experiences. His second novel, Vol de Nuit (Night Flight), is depicted on the 220fr stamp. Finally the 410fr value honors Pilote de Guerre (War Pilot). In the 1930s, Saint-Exupery quit flying to become a foreign journalist. In his books, he conveyed his ideas about flying and about man through his powerful poetic style. In 1994, a number of countries, including the Central African Republic , Hungary [B355], Israel , Mexico , Argentina and Slovakia , issued stamps to commemorate the 50th anniversary of Saint-Exupery's presumed death. Most of these issues employed a design that included his own illustrations from his The Little Prince, published in 1943. Figure 3 depicts the 5-shekel Israeli commemorative issued June 21, 1994 (1207). The stamp is designed to look like an open book with the illustration from The Little Prince on the left and a photograph of Saint-Exupery as a pilot on the right. 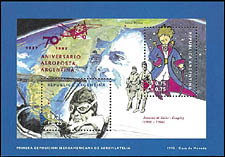 Argentina issued a souvenir sheet June 3, 1995 (B164), containing two semipostal stamps also showing Saint-Exupery as a pilot and the title character from his famous book. Figure 4 pictures the souvenir sheet. Figure 5. In 1998, France honored its native son, Antoine Saint-Exupery, with a strip of five se-tenant stamps featuring his drawings for his classic tale Le Petit Prince first published in 1943 and translated into English as The Little Prince in 1944. Click here for entire strip. The proceeds from the surtax on these 25-centavo+25c and 75c+75c stamps went to raise money for the Latin American Air Post Philatelic Exhibition. The Argentine sheet was overprinted in 1997 to commemorate the 75th anniversary of the Argentine air post (B180). Some reference books dismiss The Little Prince as a children's fantasy. Yet after reading this slim volume, I feel this will be the work by which the future will remember this author. It is a classic that can be read on more than one level. Of course, it can be read as a children's story. But on another level, this book is a modern parable, offering advice to adults about what really matters in life. On Oct. 23, 1998, France issued a se-tenant strip of five 3fr stamps featuring different illustrations that Saint-Exupery drew to accompany his classic tale. The stamps are se-tenant, or side by side. The strip, which is shown in Figure 5, also includes two labels: one with the author's name and the other with the emblem of the Philexfrance 99 international stamp show. Figure 6. New Caledonia was among the countries that issued a stamp in the year 2000 to remember the 100th birth anniversary of Antoine Saint-Exupery, author of The Little Prince. The year 2000 marked the 100th anniversary of Saint-Exupery's birth. A number of countries commemorated this anniversary with stamps. I already have issues from France, Argentina, and New Caledonia in my collection. These three stamps all feature aircraft and thus stress Saint-Exupery the flyer, although the New Caledonia issue contains an image of the Little Prince in its upper-left corner. Figure 6 shows the 130-franc New Caledonian commemorative issued July 7, 2000, the opening day of World Stamp Expo 2000 in Anaheim, Calif. The stamp includes the show emblem in the upper-right corner. Saint-Exupery is pictured at the lower right. Clete Delvaux is president of the American Topical Association study group Journalists, Authors, and Poets on Stamps (JAPOS). He is co-editor of its JAPOS Bulletin. This is an edited version of a Linn's article that appeared in the June 25, 2001, issue of Linn's Stamp News. For the complete story, subscribe to Linn's Stamp News. All content Copyright 2001 Linn's Stamp News, of Sidney, Ohio.